The guild index establishes a place to see all the various guilds in game; it lists guild name, size, region, chat type, some keywords and four contact names. To update your listings, contact Greyfyn here on the forum, in game, or on Gorgon's Head and I will update the list and publish it here. Since guilds and guild activity fluctuate, active guilds will be noted as well. A column has been added to the spreadsheet to indicate whether a guild is currently active. This information is hard to acquire, so if it is incorrect, let me know! I'll fix it up. Also, I'm wondering if any guilds want to actually put their discord information on the index. That's up to you; I would put it in the spot for voice chat and guild leadership would have to monitor that! Last edited by Greyfyn; 10-15-2018 at 07:14 PM. Reason: Added column! The index will not list guilds with leaders who have known histories of administrative disciplines. I wish to edit it or remove us if will not be able to please? Dirty Old Men are not properly represented. Mhm, waiting on your pms McNasty. I'm around. --update-- DOM info is now correct. It would be great to have information from a few more guilds--fill in those blanks! Thank you buddy you rock. Thanks for doing this Greyfyn! The guild is international although mostly US based. Hey Please plut All for region and also put that we have discord too, thanks! 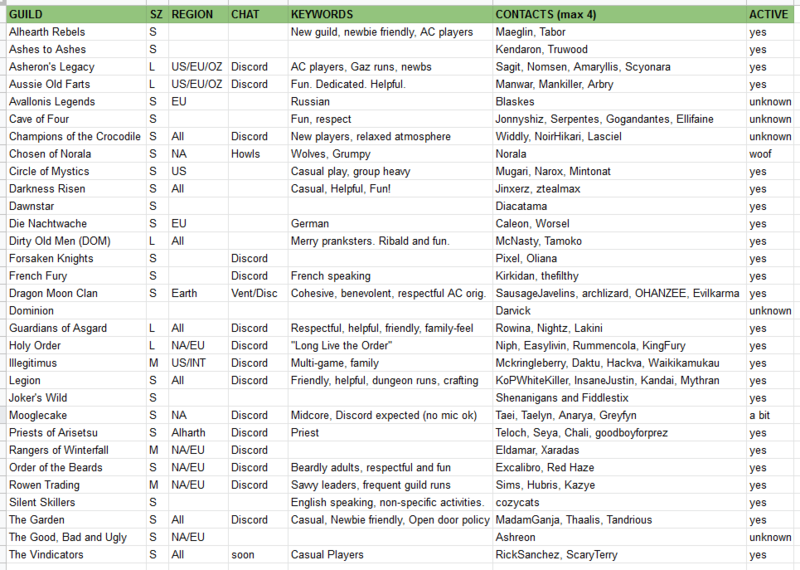 Also we now have 53 players, I don't know if thats still small or were medium now. Plaximos is A Fire Mage and Animal Tamer in Project Gorgon. He also is A Spider Druid. If you need help, he has over 400 hours in Gorgon and will provide assistance if he can! He is also apart of the guild called "Worst Players Ever", which is a smaller guild in Project Gorgon! Always accepting new people! Still looking for information from a few guilds. It would be great to keep the Index as complete as possible. hey please add Aaron and NoirHikari as contacts for the guild! thanks!